To be an entrepreneur is to expect a certain amount of anxiety. Anxiety that can be an indicator that you’re playing it big, or anxiety that can be debilitating and block your creativity. We’re going to break it down to make sure that your anxiety doesn’t defeat your creativity, and how creativity can defeat anxiety. Tiisetso Maloma has written extensively about entrepreneurship, anxiety, creativity, and self improvement. He’s the author of four books, including “The Anxious Entrepreneur,” “Anxiety Defeats Creativity, Creativity Defeats Anxiety.” He describes himself as a serial doer, and is the creator of the EBC business model, which is the essential business components checklist. Tiisetso is coming to us from South Africa, where he resides. Creativity can help us overcome our anxiety! If you catch yourself in a rut, get up and do something about it! Not all things you do at a high level will succeed — and that’s okay! Regain time and transform your commute, workout or chores into fun, productive ME TIME! Audible books are offering a free audio book, try it, like it and stay or cancel and keep your free Audible book. If you want more of your most valuable resource back, automate your calendar with our top pick, Acuity. No more back and fourth, no-shows or multiple calendars to manage. All appointments, reminders, cancellations, even payments happen with 1-click. Acuity helps you gain time! Visit creativewarriorsunite.com/acuity for our offer or click the link in the show notes. In our fast-paced world, we still need to clearly and confidently communicate what we want to say. Grammarly is our private editor 24/7 checking our spelling and grammar whenever we write something online to help avoid embarrassing mistakes in comments, tweets, and status updates! Grammarly is a Better Way To Write. Visit creativewarriorsunite.com/grammarly for our offer or click on the link in the show notes. The easiest way I know to get inspired when reading is not an option is with AudibleBooks. You can regain time and transform your commute, workout or chores into fun, productive ME TIME! Audible books are offering a free audio book, try it, like it and stay or cancel and keep your free Audible book. Visit creativewarriorsunite.com/audible for our offer or click on the link in the show notes. Warriors, if 80% of your income comes from 20% of your clients, 80% of your clients are the wrong clients! Imagine what it would be like to have almost 100% of your income come from all your clients because you’re working with the right clients. 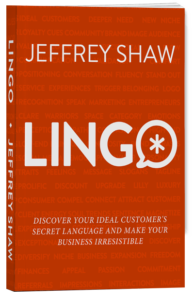 Learn how knowing their secret language will attract your RIGHT clients— people who value what you do and are eager to pay you what you’re worth. To register for this new masterclass, go to YourRightClients.com, and I’ll see you in the masterclass! Check out the Creative Warriors Gifts Page where you can grab gifts and offerings from many Creative Warriors past guests. Propel your business forward and register for Week of The Warrior for free. A 7-day mini-course to learn how to leverage your creative powers.